Leather pig skin trunk on custom later stand. 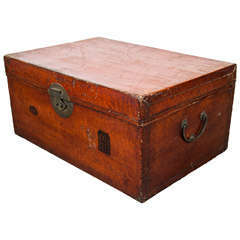 The trunk was originally used for storing ceremonial robes interior is paper lined, the exterior with a warm cognac color finish with brass handles and interesting locking latch, the trunks sits on a similarly colored custom made stand with asian influence. Trunk is late 19th century, Chinese. 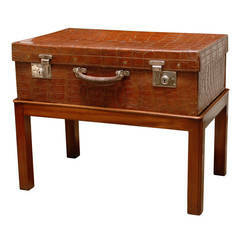 Hand-painted pigskin leather covered camphor wood trunk with metal nailhead and trim detail. China, mid to late 19th century. 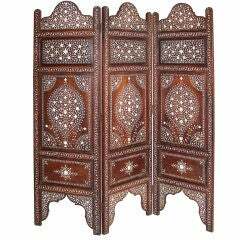 Elaborately inlaid three panel table screen. Each panel measures 15 inches wide. India, late 19th century. A nicely worn parchment leather trunk with two distinct chop markings on front. With original hardware. From Shandong province, circa 1900. CST348. 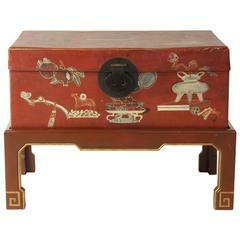 A lovely red parchment hand-painted Chinese trunk on later custom-made stand. 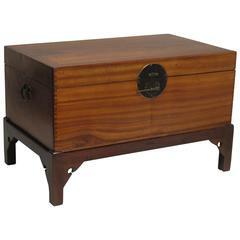 An antique red lacquered wood trunk or chest with original brass hardware from China. Guangxu period, 1875-1908.